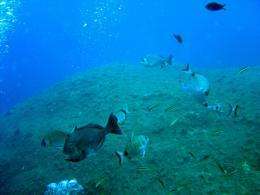 The setting up of a network of Marine Protected Areas, developed since the 1960s in the Mediterranean, has proved to be an effective way of protecting some species such as fish. However, despite the efforts made, more attention should be paid to certain areas of high biodiversity of turtles and marine mammals, especially those located off North Africa and at the eastern end of the Mediterranean. This is the main conclusion of an international study carried out in particular by researchers from the Ecology of Coastal Marine Systems Research Unit, the Institute of Evolutionary Sciences and the Exploited Marine Ecosystems Research Unit at the Marine Research Center. The results are published on the websites of the journals Current Biology and Global Ecology & Biogeography. Between 4 and 18% of marine species are found in the Mediterranean, which is a remarkably high percentage considering that this sea represents less than 1% of the total surface of the world's oceans. This biodiversity hot spot has become a priority region in a worldwide context of increased awareness of the need to protect species. The Mediterranean is also one of the maritime areas where human activity is most intensive, with heavy fishing pressure, high population density (175 million inhabitants in the whole Mediterranean region and 350 million tourists each year), ever growing pollution, and an average temperature expected to increase (+3,1 °C by 2100). To protect species and habitats, more than a hundred Marine Protected Areas (MPAs) have been created in the Mediterranean since the 1960s. However, they cover a mere 0.4% of the total surface area (9 910 km²), and were set up in local political and socio-economic contexts without any real large-scale strategy. The consortium's researchers compiled a database identifying the geographical distribution of marine mammals, turtles, birds, fish and certain invertebrates with the aim of identifying, for the first time, the spatial overlap of biodiversity with marine reserves and human pressure. They show that the various components of Mediterranean biodiversity are not concentrated in the same places, and that some of them, such as turtles and marine mammals, are outside the network of Marine Protected Areas. This large-scale approach highlights the urgency of increasing the protected surface area in the Mediterranean in order to protect the many components of biodiversity from ever increasing human pressure. Their work implies that there is a need for biodiversity management to go beyond national policies and historical constraints. The challenge now is to improve the siting of new Marine Protected Areas, especially in zones such as the North African coast and the Adriatic, which have been neglected despite their high biodiversity. These studies were partly funded by CNRS through the ten-year MISTRALS program (Mediterranean Integrated STudies at Regional And Local Scales), the French Foundation for Biodiversity Research (Fondation pour la Recherche sur la Biodiversité (FRB)), the French National Research Agency (ANR), the EU (Marie Curie Fellowships), and the Total Foundation. More information: Coll M., et al. The Mediterranean Sea under siege: spatial overlap between marine biodiversity, cumulative threats and marine reserves. Global Ecology & Biogeography. Mouillot D., et al. Protected and threatened components of fish biodiversity in the Mediterranean Sea. Current Biology.